Hope you are well today and not stuck in Buffalo like my gal Sally is! Ay-yai-yai what to do in 6 ft of snow ...? Thinking of you and sorry we missed you this week at club! Come home soon and to anyone else stuck in miserable cold weather, I hope you stay in and stamp! Here is the 3rd project that they made! Found this lovely card from Heidi B and pretty much went with it, slight modifications is all. 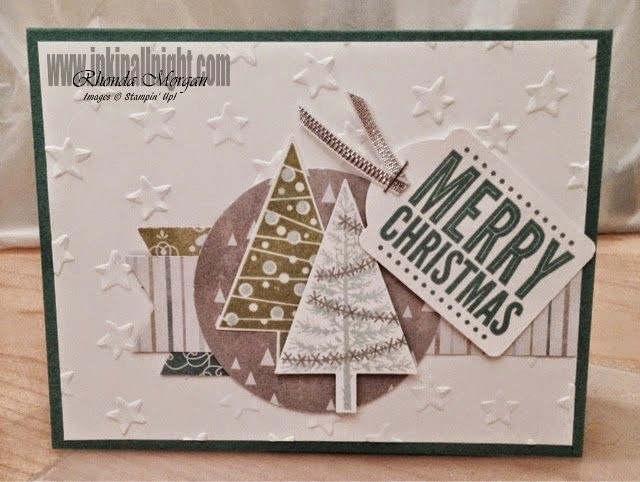 This card also features the Festival of Trees stamp set and coordinating Tree punch along with the All is Calm DSP specialty paper. It's one if my favorites!! The greeting is from the Merry Everything set in the Holiday Mini catalog and coordinating Note Tag punch - buy them as a bundle and save 15%!